COEUR d’ALENE, Idaho -- Somewhere in the back of my mind, I had heard of the golf course with the floating green – not the island green, like the 17th at TPC Sawgrass, but the floating green. But I had no idea it was in Northern Idaho, of all places, and I didn’t know it was at an upscale resort on a giant lake, Coeur d’Alene Resort and Hotel. Now I know, and now I have played (bogeyed) the famous "floating green" at Coeur d’Alene Resort Golf Course, where a boat actually ferries you from tee to green, which on the recent day I was there was playing 175 yards (185 into the wind). I came out here to Idaho a few days ago with a group of golf and travel writers. We were brought together by Coeur d’Alene Casino Resort Hotel, in nearby Worley, so they could show off the $100 million upgrade to their casino, hotel, steakhouse, spa and their top-notch resort course, Circling Raven GC. To make the trip even more worthwhile, they threw in a round at the aforementioned Coeur d’Alene GC, plus a third round at another course about 90 minutes north, The Idaho Club Lake & Golf Retreat, a swanky affair with pricey mountaintop homes overlooking a Jack Nicklaus Signature Course. When we weren’t on the golf course, we were treated to a couple of sumptuous dinners – the kind where the chef comes out and explains each course – and a deep-tissue massage at the spa. There were seven of us writer types on the trip, mostly from the Western U.S. (San Diego, L.A., Portland) and western Canada (Calgary), because all three properties we visited pull most of their business from the West and Canada. One writer in the group was from Michigan. I was the token East Coaster. Northern Idaho is hardly a destination for gamblers or golfers from Philadelphia but they extended the invitation and, hey, I’d never been to Idaho. Back home in the heavily populated East, we might be inclined to describe the Coeur d’Alene Casino Resort Hotel as being out in the middle of nowhere. Technically, it is out in the middle of nowhere, just off the cloverleaf near U.S. Route 95, which is not to be confused with I-95. Here, they think of their casino/hotel as being a beacon of entertainment, gambling and quality golf free from the congestion and traffic gnarls of, say, Center City Philadelphia. All I know is that your to get here, you fly into Spokane, WA., then hop a shuttle bus for the 40-minute ride to Worley, in the Idaho panhandle. Naturally, I wondered why they call it Coeur d’Alene Casino Hotel if it’s in Worley, 27 miles from the town of Coeur d’Alene? That’s because just about everything is called Coeur d’Alene, after the Indian tribe of the same name. The land, the casino hotel and golf course are owned and operated lock, stock and barrel by the tribe. Not so for the town of Coeur d’Alene nor the similarly-named resort hotel. My fellow writers and I were in new part of the hotel, where suites are equipped with two big-screen TVs and floor-to-ceiling windows that overlook a sort of botanical garden and preserve. They told me that if I look out the windows long enough, I might eventually spot a moose or two. I never did, although a moose did wander by one of our foursomes on the golf course. I’m not a much of gambler so the casino downstairs was wasted on me. I walked it several times on the way to a restaurant and the gift shop, however, and I couldn’t help but notice it had one of the best ventilation systems I’ve come across in any casino anywhere. The cigarette smoke wasn’t that bad. A two-minute walk from my hotel room was Coeur d’Alene Casino Hotel’s golf course, Circling Raven. I played it Monday afternoon, half-pooped from the long flight, and again Tuesday morning, when I was much fresher. Designed in 2003 by Gene Bates, design partner of Fred Couples, Circling Raven is spread out over a vast expanse of 620 acres. It’s a terrific resort course, with generous, forgiving fairways, big easy-going greens and vistas of the Idaho countryside and mountains beyond. There’s very little water to worry about and no beastly forced carries, assuming you play from the proper tees; in two rounds I lost only one ball, when I plunked a tee shot into an environmentally protected area. I was not surprised to see that Circling Raven ranks 66th on Golfweek’s 2012 list of Top 100 Resort Courses, or that Golf Digest ranks it among America’s 100 Greatest Public Golf Courses and Golf Magazine includes it among Top 100 Courses You Can Play. I’d never been to Idaho before, but I imaged it would be full of rugged terrain, ski resorts, and craggy rock formations set against rich blue skies. What I did not envision was a ritzy high-rise resort and spa on a 25-mile long lake with a marina like you see at the Jersey Shore. Nor did I expect to find a $200-plus-a-round golf course that hugs the coastline of the lake, which is so deep the U.S. Navy supposedly uses it for submarine training and testing. As pricey as it is, Coeur d’Alene Resort and Hotel attracts precisely the kind of affluent clientele you’d expect. The golf course turned out to be not only much better than I expected, it was as immaculately groomed and conditioned as any course I can recall playing in years. It’s one of those courses where you are required to take a cart and a forecaddie. (The forecaddies wear those white Augusta National-like jump suits and dash around from ball to ball, with a laser gun. By the time you get to your ball, your forecaddie has all the pertinent info: yardage, pin placement and recommendations about where to miss and where not to. I must also say that in 50 years of playing golf, it was the first time I encountered custom-built carts, with tilted steering wheels, carpeted floors, tee dispensers, built-in trash cans and a hood that opened to reveal an ice chest and a place to store sandwiches and sodas. The star of the course, obviously, is the par 3 14th, which is billed as "the world’s only floating green." Golf Channel did a story on it for Golf in America. The green is 15,800 square feet, weights 5 million pounds (give or take, depending on the moisture in the soil) and can be moved to play anywhere from 95 to 200 yards. On average, they set it up at about 147 yards. It’s a cool hole, obviously, if slightly gimmicky. If you ask me, even without the 14th, it’s a memorable round of golf. On our last full day, they piled us back into the shuttle bus for the 90-minute ride north to the town of Sandpoint for a taste of Idaho that fulfilled every expectation I had. If Coeur d’Alene Casino and Hotel is a getaway for casino day trippers, weekenders and "buddy" golf trips, and Coeur d’Alene Resort and Hotel is a vacation spot for couples and families with a few more bucks to blow, The Idaho Club Lake & Golf Retreat is the private playground for the moneyed class – at least that was the original idea. It was clear from the moment the guard waved our bus through the gate, The Idaho Club was built to be a second club and getaway for people accustomed to living on Easy Street. Photo gallery. It’s got a first-class, rough-hewn Jack Nicklaus Signature Course that wends its way through the trees and streams, overlooked by multi-million dollar dotting the hillsides. In the promotional brochure, The Idaho Club notes that the New York Times described Sandpoint as "Old West Atmosphere in a Sporting Paradise" and Rand McNally named it the "most beautiful small town in America." All has not gone well for The Idaho Club. Not long after they threw open the doors, the economy tanked, the housing market bottomed out and the golf boom fizzled. Lawsuits flew, lenders foreclosed, then, if that wasn’t enough, the magnificent log cabin clubhouse burned to the ground. Still, The Idaho Club limps on, with a steely resolve and sunny outlook, if only about 75 members. The people who own it and run it couldn’t be nicer. They are convinced that times will get better and that The Idaho Club will live out its potential. I wish them luck. If anyone is interested in starting a debate about what is the most-overlooked, under-appreciated course in the area, I hereby nominate White Manor CC. I know that Bradley Klein, the architecture editor for Golfweek, was more than pleasantly surprised. And after the round, over beers and conversation, I talked to raters in town from Chicago, upstate New York, Maryland and North Jersey who all wanted to know why White Manor, in Malvern, doesn’t get more talk and more respect on the Philadelphia golf scene? I didn’t have a good answer, except to say it’s a tough league around here. It’s not like I’m a stranger to White Manor; I’ve played 10 o 12 rounds there in the past 10 years. I walked it but didn’t play it in the late 1990s, before the club brought in architect Bobby Weed (GC at Glen Mills) in 2002 to do a complete overhaul. Boy, did he ever. With the club’s approval, Weed took out hundreds of trees, transforming White Manor’s original early 1960s layout from tight, tree-lined corridors to a course with wide-open vistas. Weed also shifted several green complexes, repositioned and rebuilt bunkers, and reimagined shot angles across the course. In those days, White Manor one of a handful of predominantly Jewish country clubs in the area, along with Meadowlands, Green Valley, Radnor Valley and Philmont. Not all the members at White Manor bought into the idea of the renovation, let alone the cost, and the club suffered an exodus of about 80 members. There were concerns about the club’s future. In 2003, when they unveiled the new-look course to much fanfare in the local media, I was fortunate enough to play the round with Weed, who painstakingly explained every change he made on every hole. I remember liking the course, but nothing like I do now. At the time, I didn’t have a full appreciation of the dramatic changes Weed and the club had pulled off. Plus, it somehow felt too new in a city where the golf scene is largely defined and dominated by classic-era gems. In the years since the renovation, White Manor has recouped many of the lost members; the club has also developed enormous pride in its course, with good reason. No conversation with a White Manor member goes on too long before they ask: (a) What do you think of the course? (b) Why doesn’t it get the love we think it deserves? Perhaps because of the love denied, White Manor members are constantly on the lookout for a tournament, a qualifier, an event -- anything that will get the course better known on the local and national stage. Until my round last week, I thought they were largely kidding themselves. Yes, White Manor is now first-rate, but even among modern courses, a couple of locals stood taller in my mind: Philadelphia Cricket’s Militia Hill course and The ACE Club. Now, I’ve come to believe that White Manor gives nary an inch to either Militia Hill or ACE. It has matured and evolved oh-so-nicely in nine years, and superintendent Donald Brown had the course groomed to perfection last week. As much as the course has changed in nine years, so has the membership – it’s now 60 percent non-Jewish. The golf chairman is a proud Irishman. Whether White Manor has a shot to crack Golfweek’s list of Top 100 Modern Courses, I don’t know. But I can say with certainty that it’s no longer a wallflower on the Philadelphia golf scene. Thanks for the piece on White Manor Joe. A terrific golf course and the Weed renovation work is indistinguishable from what pre-dates it. Glad that the rater group was impressed. I have only played it once thanks to a mutual friend and can’t wait to get back. Now, we’re really getting somewhere. 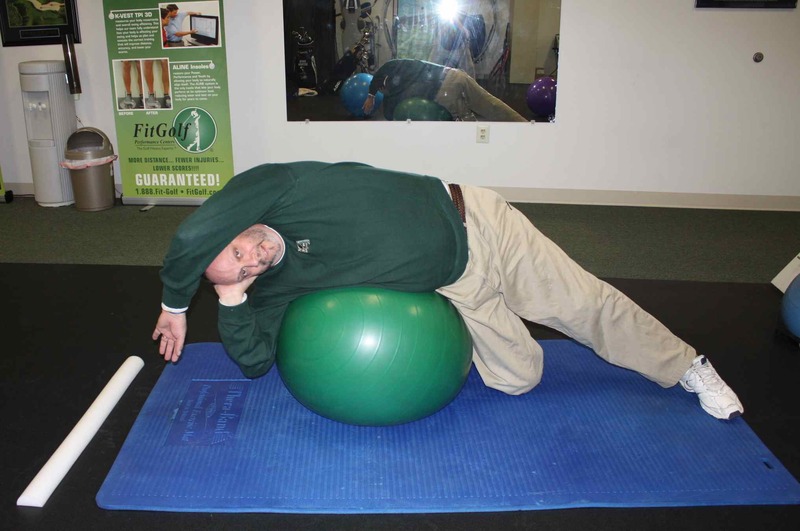 In my first three weekly sessions at FitGolf, physical therapist and owner David Ostrow concentrated on "releasing" the major muscles in my hip and lower back. In each case, Ostrow, a large man with fingers and thumbs that could puncture a propane tank, spent 40 minutes or more working his fingers deeper and deeper into my tight and constricted muscles until they finally released. It’s hard to describe the resulting sensation, other than to say you get up from his treatment table feeling like a rusty Tin Man who just got a couple of drops of oil in the right spots. During each session, Ostrow would explain why he was doing what he was doing, when he was doing it. He likened the process of unlocking the new and more limber me to constructing a house. Things have to be done in the proper, logical order. You can’t build the roof until you’ve laid the foundation and erected the walls. Four weeks in, we’re still laying foundation. Which brings us to my hamstrings. With my hip and back muscles, I sort of knew they were tight and inflexible; it’s hard not to know that when your golf swing has devolved into mostly arms, without benefit of much shoulder and hip turn. But my hamstrings are another story entirely. I didn’t need Ostrow to tell me just how bad, how tight, they had become -- I could feel it myself. For years, I’ve been trying to stretch my hammys, to little or no avail. I’d work out at my neighborhood YMCA, where Jim, the PT guy, would get me down on my back and push of first one leg, then the other. I’d cringe in pain and misery. Until Ostrow enlightened me, one thing I didn’t realize about the sorry state of my hamstrings is that they affect so much else, up to and including my posture when I’m addressing a golf ball. I’m 6-foot-1 and at address, I tend to slump over the golf ball. My back, from hips to head, is not ramrod straight, as it should be. But according to Ostrow, my poor posture wasn’t a back issue so much as a hamstring issue. Get those puppies stretched out properly and my back would straighten. Once I was on the treatment table, it didn’t take Ostrow long to determine that my left hammy was much tighter than my right. On a scale of 1 to 10, with 10 being the worst, my left hammy was a 6 or 7 on the tightness scale. Lying on my back, he could only lift my left leg about 45 degrees off the table before I was crying, "Uncle." Normal is about 90 degrees. Ostrow rolled me over onto my stomach and went to work "releasing" my left hammy. "It’s the tighter of the two, and it’s shorter," said Ostrow, as he worked. "I envision it as knotted and bunched, like a wound up rubber band." So important are the hamstrings to the golf swing that we will spend the next four sessions getting them released and stretched out: An hour on the upper part of the left hammy, an hour next week on the lower part of the same muscle. Then, two weeks on the right hamstring, upper and lower. "What you have a job hazard," said Ostrow. "I call it the executive disorder or executive dysfunction." Like millions of golfers, I spend the bulk of my day sitting at a desk in front of a computer. In the sitting position, your hamstrings are contracted by about three inches -- even more if you tuck one leg under the other. This affliction isn’t confined to desk jockeys – same thing applies sales reps who spend all behind the wheel of a car. The problem, said Ostrow, is that over time, you hamstrings comes to believe that the shortened position is the normal, relaxed position. They adapt accordingly, becoming permanently shorter. 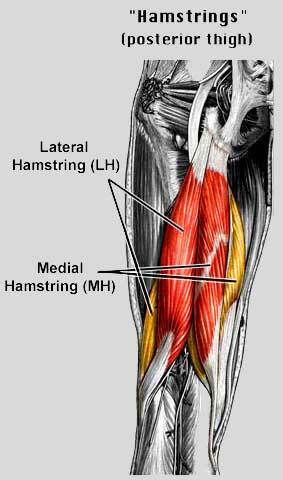 Ironically, in our quest to stretch the hamstrings, we can occasionally do more harm than good. 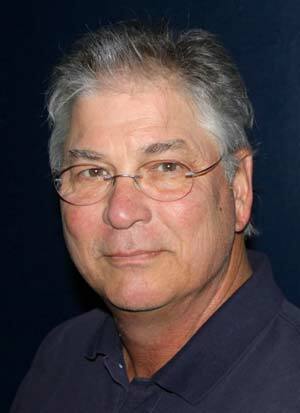 "A lot of people stretch too hard, until it hurts," said Ostrow. That, in turn, can activate what he calls the body’s "stretch reflexor." "When we stretch too much, the body gives us pain to warn that you are going to strain the muscle," he said. "The body’s reaction to that is to actually contract the muscle that is being overstretched." The following week, Ostrow was out of town on business, so my session was with his deputy, physical therapist John LaRue. While Ostrow worked on my upper left hammy, LaRue worked lower down, closer to the back of the knee. Midway through the session, as John was describing several ways in which a bum hamstring limits your mobility, he took a not-so-wild guess at a case in point: how he suspected I retrieve a golf ball from the bottom of the cup. "I’d put money on it that one leg comes up, you bend your back down as much as you can, then give a little in the front knee as you reach down with your left hand," said John. "Meanwhile, you’re learning on your putter with your right hand." That is exactly how I fish a golf ball out of the cup. In the days since, the work on my left hamstring has made more difference in my golf swing and, indeed, my non-golfing activities than anything so far. I can bend over more easily. It is a noticeable improvement. This afternoon, we move to my right hamstring. I look forward to it. Not to make too much of the Q&A video with fans that Tiger Woods has posted on his official website, but I don’t think it’s good news for golf or for golf fans. Never mind that the 15-minute, 19-question video is b-o-r-i-n-g. More concerning, it is further evidence of a growing chill between Tiger and the media and his desire insulate to himself from nosey scribes with pesky, embarrassing questions. A little background. At most tournaments -- all majors and anywhere he is defending champion -- Tiger goes to the media center for a 30-minute pre-tournament sit-down with the assembled media. Lord knows those interviews can be boring, too, often full of softball questions or rambling non-answers from Tiger. Tiger, after all, has never been one to spill his guts about anything. In fact, if you read Hank Haney’s book, The Big Miss, Haney confirms that Tiger derives much mystique and power over other opponents by revealing nothing, letting no one inside his head. But since his personal life crack-up, Tiger’s cordial but arm’s-length relationship with the media has deteriorated to the point of open hostility. Monday, at the Wells Fargo Championship in Charlotte, Tiger declined to do the usual press conference and instead posted a video on his website of himself answering fan questions. What’s wrong with that? Nothing, per se. I have read a few blogs by people who think the media is getting its comeuppance and deserves the stiff-arm from Tiger. I won’t argue that point one way or the other. What I will argue is that if this is what we are going to get from Tiger from now on, he might as well go into exile. Did you get a load of the questions he hand-picked to answer on the video? -- What have you been working on since the Masters? -- Which is your favorite trophy of the four majors? Bottom line, if Tiger adopts a new communications policy of going straight to the fans, avoiding the media whenever possible, allowing only softball questions to penetrate his personal space, no nobody benefits. Tiger might think he does, but he doesn’t. What’s good for golf and good for Tiger is him being compelling. That fan video he posted is not compelling. Last week at FitGolf in Conshohocken, physical therapist David Ostrow released the Iliascus muscle on the front of my pelvis. This week, to "release" the corresponding muscle in my lower back, he flipped me over onto my stomach and went to work on my left quadratus lumborum. The quadratus lumborum, which resembles a flank steak, wraps along the side of your back, between the 12th and 11th ribs. When it become tight and contracted over time, as my has, it contributes to the asymmetry of my entire body, with my left shoulder being lower than it should be and my left hip being higher than it should be. The resulting affect on the golf swing is that the rotation on my back swing is restricted. No turn, no torque. No torque, no distance. After a few minutes of working on the muscle, Ostrow had me roll over onto my right side, whereupon he gripped my left pelvis with his left hand and the bottom of my rib cage with his right hand – and then me began to pull them apart, stretching my entire left side. "We are releasing the back muscle," he told me. It didn’t hurt but it was not altogether pleasant, either. Afterwards, Ostrow took me out into the main studio to show me a side-stretch exercise for the coming week. After he demonstrated, I tried it. It felt good – rather, it felt good for me. I won’t mind doing it all week. With my swing and my body fully evaluated at FitGolf in Conshohocken in Week 1, it was time for David Ostrow and me to get down to work. The goal in the coming weeks being to improve my flexibility and range of motion, both of which have more or less ossified over time. In Ostrow’s judgment, the place to start was pretty much a no-brainer: my hip flexor. In laymen’s terms, the hip flexor is the group of muscles around the hip and pelvic area that control the rotation and movement of your hips. In my case, my right side is okay. It’s my left hip and pelvis that are tight to the point that I can’t rotate properly when I swing a golf club; it’s bad enough, in fact, that when I walk long distances, I tend to limp slightly or almost waddle because my left side won’t turn and flex as it should. "We’re in the Keystone state and I think of the pelvis as almost being the keystone area of the body," said Ostrow. "It unlocks a lot." 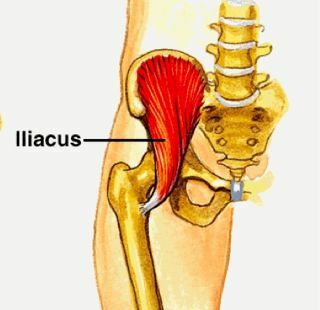 Key to addressing my hip flexor was "releasing" my Iliacus muscle, a teardrop-shaped affair that attaches to the hip by a tendon, then heads north before fanning out and attaching across the upper rim of the pelvis. It helps pull your leg forward when you walk. To work on it, Ostrow had me lay face-up on his examining table and he began working the fingertips of his right hand into the Iliacus muscle. He pressed firmly and steadily with his fingertips without really messaging the area; it didn’t hurt but it was mildly uncomfortable. Ostrow likened what he was doing to pressing on skin of an onion until that outer layer began soften; then he worked his fingertips in a little deeper, until the next layer of the onion, or my Iliacus muscle, was soft. Ostrow would continue working his fingertips until the Iliacus eventually, almost magically, released. In some people, this process takes five minutes, said Ostrow; in others it takes three hours. My Iliacus took about 30 minutes to release, which is about average -- and there was, as always, a warning. "When the muscle is about to release, my fingertips get warm to the touch," said Ostrow, holding out his hand for a moment for me to feel his fingertips. Sure enough, they were warm. He returned to his work and within a few moments, done. "When it releases, some people say they feel Ôlight," said Ostrow. "Some say Ôlooser." Some say Ôsofter."" When I stood, I too could feel a difference. My left hip felt, I don’t know, looser, freer. When I took a few steps, my left hip felt like it was moving better. The point in dealing with my hip flexor first was to begin to deal with what Ostrow called the "asymmetry" of my entire body. Because my hip muscles on left side were so tight and contracted, it actually made my left leg slightly shorter, which has all kinds of ramifications on other muscles in your midsection, not to mention your golf swing. Out in the studio, Ostrow assigned me an exercise to do at home every day for five minutes to keep the hip flexor loose. Basically, I lie across a giant rubber ball, with my left hip muscles stretched out. I’ve done it almost every day and, while it doesn’t hurt, I do find myself watching the minutes and seconds bleed off the clock until I can quit. Seriously, my what is shorter? As our second session was concluding, Ostrow told me what we’d tackle next week; frankly, it sounded a little creepy: For reasons he cannot explain, the muscles up and down the left side of my upper torso have tightened and shrunk to the point that my left shoulder is slightly lower than my right shoulder, and my left hip is slightly higher than my right, truncating the area between my left shoulder and left hip. While it sounds bizarre, Ostrow said that upwards of 90 percent of people have this same phenomenon to some degree. It can happen on the left side or the right side, and there is no apparent explanation for which side it happens to. The fact that I am left-handed has nothing to do with the asymmetry affecting my left side, said Ostrow. What especially surprised me was that I had never noticed any of this until Ostrow had me standing in front of a wall full of mirrors examining my reflection. Sure enough, my left shoulder is perceptively lower than my might. Nothing puts Ostrow’s work to the test more than playing a round of golf. I did that three days after our session, on Saturday, monitoring my body at every step. While my score didn’t drop dramatically – at all, really -- I could definitely feel difference in my left hip. I walked better, more loosely, and at least in my head, I imagined a slight improvement in my hip rotation when I swung.